Well finally I have made it back to the computer after roaming around the coast and working the rivers the last couple of days. In my last blog I made mention that I was fishing in a land based fishing comp out of Whitianga and would get back to you all on how it all went on. It was a great weekend with a few fish caught and some very tough lessons learnt while trying to deal with big angry snapper which just want to make it to the nearest kelp bed. The guide I had was a real nice guy but I have to question his ability and knowledge as he fell down a cliff injuring himself which ended up in hospital before even getting a line in the water. These rocks were brutal and I wished for the amazingly soft rounded boulders of the Tongariro-hope your ok Paul. 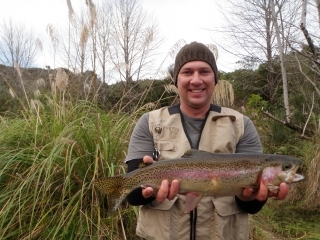 Anyway back to real fishing here in Taupo. The Taupo rivers have slowed down a wee bit and many different reports are flooding in through the website and the shop. Most rivers are running low and clear and a wee bit of rain would be perfect right now just to get the fish on the move again. Generally angling pressure on the rivers have been fairly quiet considering it is school holidays. Most guys are having fairly lean days on the Tongariro at the moment and this is one river which could really do with aÂ blast of freshwater to get things moving again. Conditions are really quite good with water levels and over cast days but anglers must try and adjust to the very clear water. If you are not catching trout keep moving and cover the river as eventually you and your party will run into good numbers of fish sitting tight away from the flow of anglers. Try different ideas and keep changing flies, leader length and drift techniques. Small naturals will do the best at the moment but one should always start with a glo bug first up in the morning as there will be fish in the system full of ripe eggs. The wind is howling at the moment which is proving hard for most anglers so finding areas which suit your favoured arm will be a smart move. I guided Rob and Dan this morning from Auckland and despite all the reports of hard fishing these boys had their limits by mid morning. We were fishing the Hine in the little lies that I have been doing well in lately and generally I was still impressed with the fish which were coming to the net. Nothing fancy was used in here and the good old orange glo bug continued to do the damage in the lower and upper river. 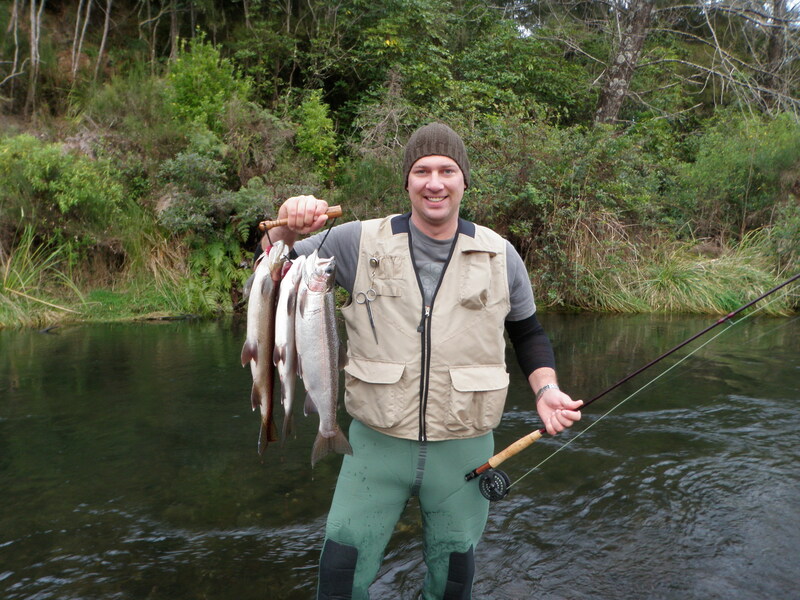 Dan was stoked to finally land his first legal trout while Rob made short work of most fish in the easy drift pools. This river has been great this season but should start slowing down soon as the river further south should start to receive more heavier runs. There are alot of anglers, guides and retailers which have different views on if the upper section of this river should be open to winter fishing but we could weigh up the pro’s and con’s all day with that one. The TT has held it’s own in the last few days and slowly more and more fish are getting caught here especially in the lower reaches. This river is actually receiving most of the fishing pressure at the moment but most anglers seem to be finding at least one fish on an outing. The level of the TT is quite low again and needs another top up of both trout and fresh water. The mouth will be worthÂ a look if you are after something a bit different but take care making your way to the drop of as the lake has risen! With all the wind hitting the beaches of this side of the lake the fish should be confident in moving into the Waitahanui and running the straight past the locals. Being here first thing in the morning certainly helps you get a spot and get of the mark but taking a short walk around the first bend up river can pay off as well. Well worth a look leading into a busy weekend. I know some of you readers wish you had other jobs and could beÂ closer to be involved with something you really love and now you can. The oldest fishing store in Taupo has been operating for over 50 years but is now for sale to a good enthusiastic angler(buyer). Peter had decided it’s time to move on and do more fishing himself and has regrettably put the business on the market. This the perfect opportunity to buy yourself a new lifestyle and live the dream……. 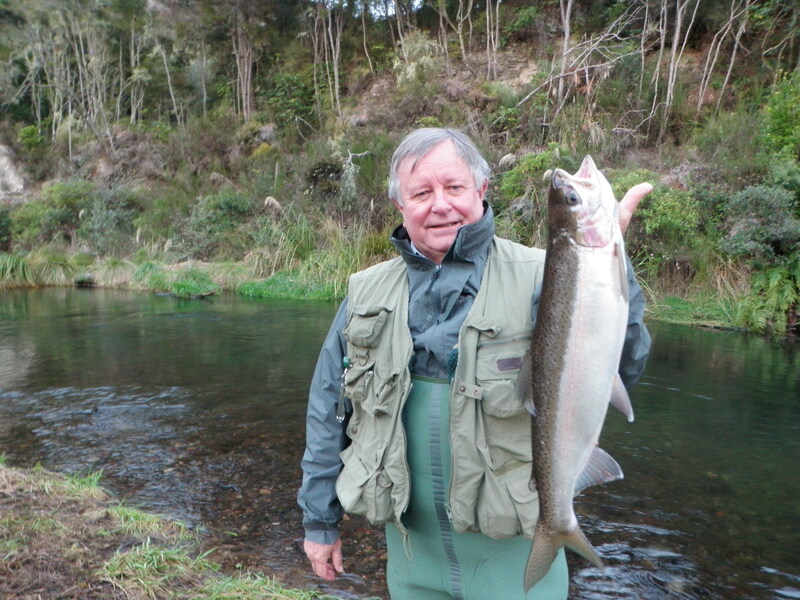 Taupo Rod’n Tackle is now FOR SALE for $99,000 plus stock at cost price. If you have any enquiries or just want to deposit money straight away give Peter a call on 07 378 Â 5337.